This week at "Dinner easy" we are focusing on the side dish or better known as the supporting player to a great meal. You can’t have an orchestra without the string section and you can’t have a villain without a minion. The same goes for dinner. What’s a main course without a side dish? I’m of Greek ancestry; my husband on the other hand is Irish. I am willing to bet before he married me he never tasted any Greek food in his life. 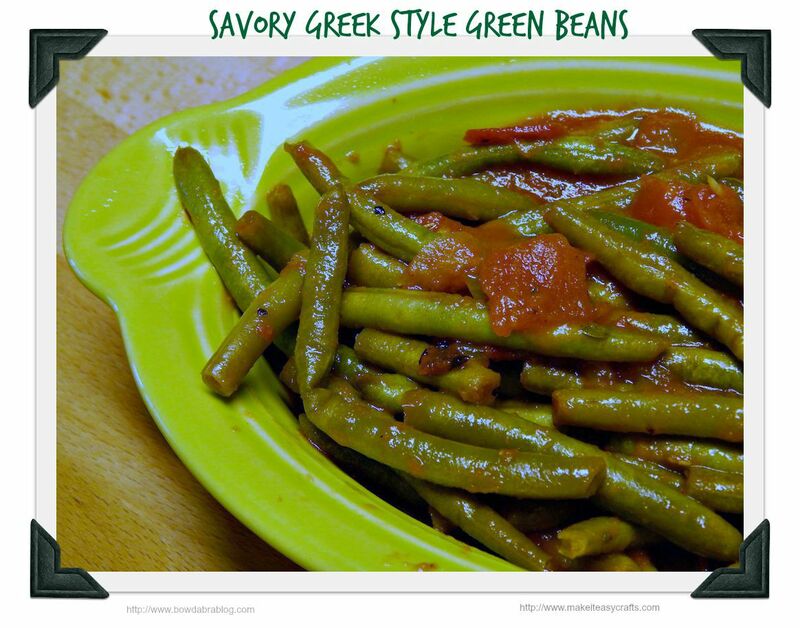 It’s opened up a whole new culinary experience for him and one of his favorites is Greek style green beans. In fact if you ask him what sort of veggie he likes best he will always say Greek green beans. Pair this easy side dish with our moist delicious meatloaf recipe, add a baked potato and you have a complete dinner easy! Heat the oil on medium heat in a large pot. Add the onions and garlic and sauté about 5 minutes until the onions are translucent. Stir in the green beans and cook a little longer. Reduce the heat to medium low. Add the tomatoes, tomato sauce, salt, pepper, oregano, and lemon juice. Cook on medium low for 5 more minutes. Reduce heat to low, cover and simmer for about 45 minutes. Be sure to visit Bowdabrablog and Make it easy crafts for Dinner easy next week for more tasty recipes! 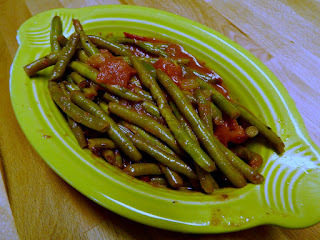 There is nothing I love better than green beans. It is one of my favorite vegetables. I am so happy that you shared this link on #HomeMattersParty and I hope you will come vack and share again.